The safest fillers for treatment of under eye bags, dark circles and hollows are Hyaluronic Acid Gel fillers. This class of fillers includes Restylane, Belotero, Juvederm, Perlane, Voluma and others. They are all the same product, just made up of different consistencies (ie. density, thickness, flow, etc). Injecting these fillers should not be done indiscriminately without a true understanding of how they work or the differences in their biochemical makeup. It is this knowledge of the filler products that makes all the difference in outcome. The best way to attain the best results with eyelid fillers is to have an eyelid specialist do your under eye injections. Dr. Guy Massry, MD, a Beverly Hills ophthalmic plastic surgeon and cosmetic is an eyelid specialist with years of experience in filling eyelids with hyaluronic acid gel fillers. Dr. Massry takes a customized approach when treating patients, determining the best filler treatment plan based on their anatomical needs and personal aesthetic goals. He meticulously identifies the areas of need and appropriately fills the area as necessary. Complications from fillers can include excess swelling, blue color change, irregularities, and lumps and bumps. Patient can experience these side effects even when in the best of hands (often require adjustment), but less so when an experienced eyelid injector is placing the filler. Below are some before and after Restylane injection pictures of a typical patient who desired filler for lower eyelid bags and hollows. 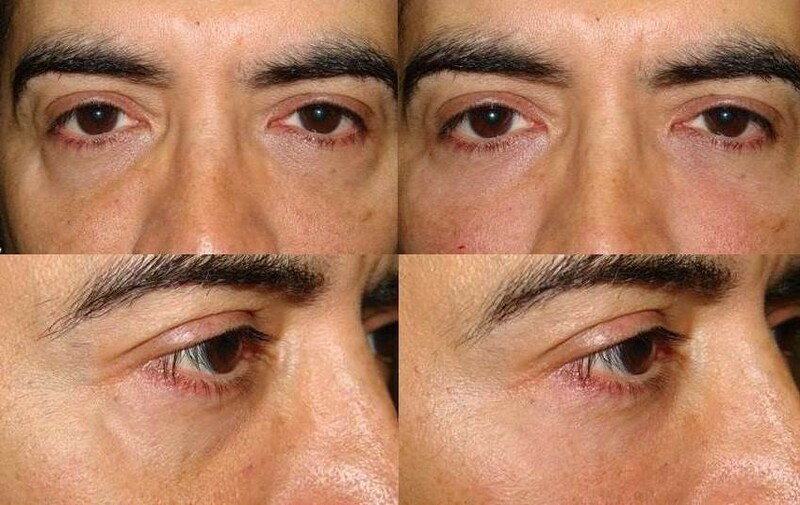 Restylane was placed carefully and the result is shown (left side before filler – right side immediately after). If under eye circles or hollows are making you look less youthful, come see Dr. Massry so he can help you look your best again! Call us today to schedule your under eye fillers consultation with the best oculoplsatic surgeon in Beverly Hills – 310.657.4302.